About-Founder (GoGreen Rao) - GGI-Group size: 4000+ Professionals, Increasing on day to day basis, Come & join us 2 serve Mother Nature. 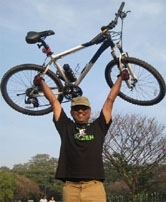 Go Green Rao, The whole of Indian Cycling forum do recognise me as GoGreen Rao..
Having a total experience of 23 years of IT related jobs. Last worked as CIO with one of the leading Garments exporter company in Bangalore, taking care of their IT infrastructure. 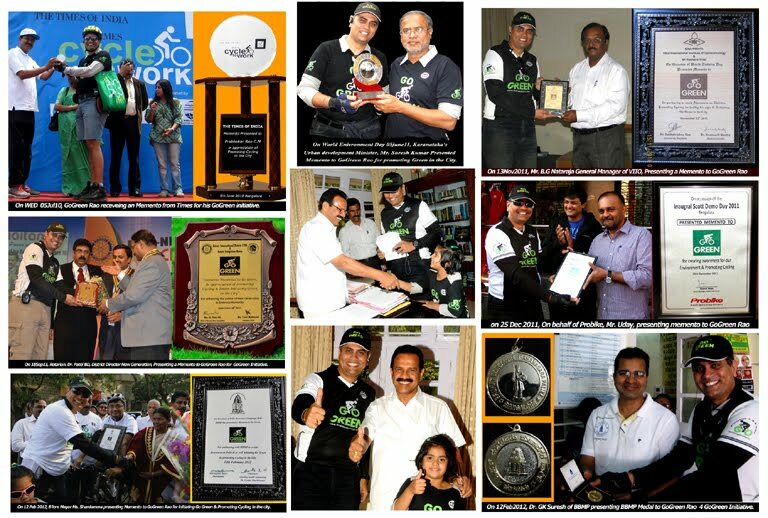 Resigned from my post of CIO on 20 September 2013 & started perusing my passion of Go Green campaign as fulltime. Born & Bought up In a place called Gangavathi also known as “Rice Bowl of Karnataka” (390Km from Bangalore ) surrendered by paddy field greenery. My Inspiration for starting this “Go Green Go Cycling” Campaign came up after watching a documentary movie called “An inconvenient truth” (http://www.climatecrisis.net/trailer/ a Documentary movie all about Global warming, directed by Davis Guggenheim, presented & narrated by former United States Vice President Al Gore. This movie's DVD was presented to me by my boss Mr. Raju Mahtaney in the month of june 2008 and after watching this movie, I started thinking about contributing my part time & my family time to the Mother Nature. I choose Cycling to be one of the best mode of payback to Mother Nature as it not only helps to save fossil fuel and is environmental friendly but also gives out various personal benefits like keeps us fit & Health, Saves money & specially in cities it can also saves time. 2nd September 2008 was the day I started Cycling to office. Very soon, I felt cycling alone will not make any impact on the global warming that is when I decided to talk to my friends & relatives, shared my idea about my thought of cycling, Going Green & Global warming but had couple of hiccups, Primarily, nonstop honking from Car/bus drivers behind me & non-cooperative motorcycle riders all together pushing me to rethink about choosing my option of Cycling, this is when I designed a T-Shirt and called it as Go Green T-Shirt & had a message printed on it “Go Green” in the front & rear side reads “For a better tomorrow, I am Going Green how about you“, very soon I started having like minded people around me with whom I formed a group and named it as “Go Green Initiators” in short GGI. (Who not only cycle but also share their ideas and help other to cycle). 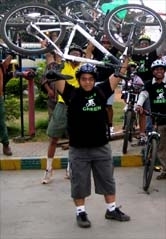 In the beginning i posted my thoughts in my personal blog Since wanted to reach to more people hence created a website by name www.GoGreenGoCycling.org. 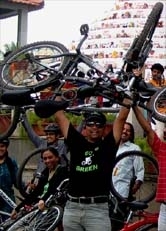 It took almost a month and half (12 November 2008) to make up my mind to creat a google blogspot https://GoGreenGoCycling.blogspot.in & started sharing my thoughts and also used to update my Go Green Campaign ride. The first ride started off with a team of 5 members consisting of myself, along with my younger brother (Sashikanth Rao), 2 brother in-laws (Prasad Raju, Satish M.C ) & 1 of my school met friend (G.R Vijay Kumar) from that day till date there was no look back. Month after Month, our team size started growing bigger & bigger, creating a stronger base of cycling Community not just in Bangalore alone but other parts of our country. I am proud to be the founder of this Group & my dream is to try & take this initiative to every corner of India & make each one to contribute their time and effort to save mother nature.